Specially designed formulae contains a blend of growth enhancing components called class A&B Bioactive peptides, aminoacid ligands Enzymes, Prebiotics, Bacitracins, probiotics, immunity boosters, chelated trace minerals fortified with peptides. Class B Bioactive peptides enhance the nutrient absorption and assimilatiom, reduce the loss of nutrients during digestion process. Class B Bioactive peptides enhance the muscle and bone metabolism leads to bone and muscle growth. Enzymes enhance the digestion of biomolecules. Immune boosters pro-alert the immune system to fight with pathogens at the time of risk. Probiotics maintain gut pH and equilibrate the normal flora of gut. Prebiotics enhance the energy metabolism. Aminoacid ligands equilibrate the mineral and vitamin absorption, assimilation and protein metabolism. Challenged improvement in broiler performance with healthy weight gain. 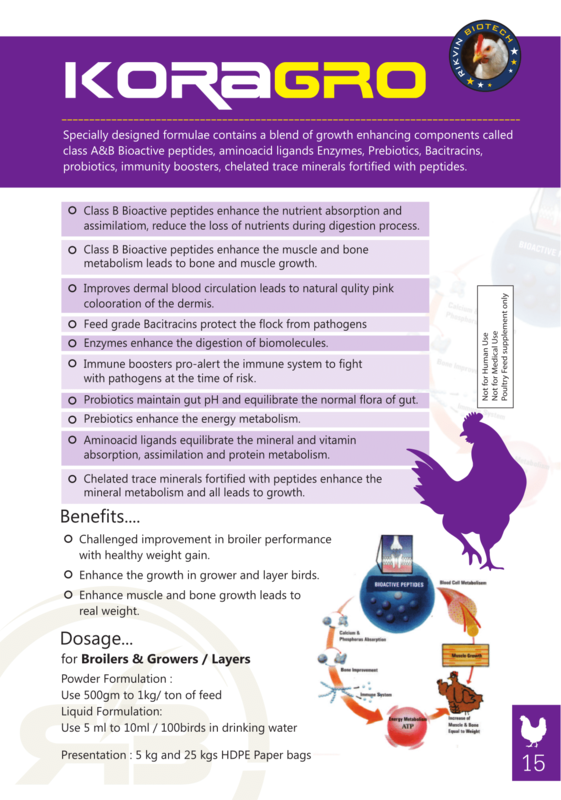 Enhance the growth in grower and layer birds.